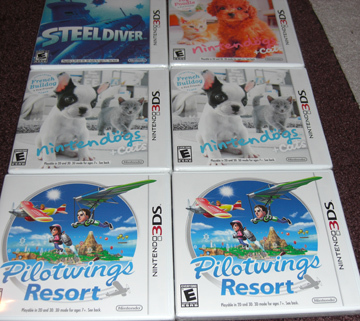 BLOG – 6 New 3DS Games for $30! For whatever reason, Bestbuy was selling 3DS games for $5 yesterday (12-22-11). Call it a crazy one day sale. Or even a typo. 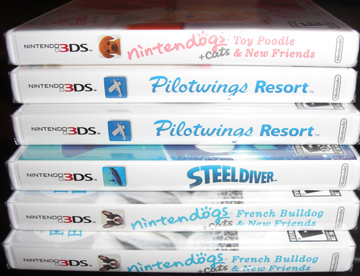 But whatever the case was, they were selling Pilotwings Resort, Steel Diver, and Nintendogs + Cats French Bulldog version and Toy Poddle version for $5 each. And just to be clear, these games usually sell for $40. Thanks goes out the Nintendo feed on Twitter as they brought this sale to my attention. But of course there was a catch – you had to do in-store pick up. This is not seen negatively as I would most likely have chosen this option anyway to save on shipping costs. However, only a select few stores in my area were eligible for this. Long story short, I placed my order for one Steel Diver, one Toy Poodle Nintendog, two French Bulldog Nintendog, and two Pilotwings Resort. I bought extra copies to make a profit selling on Craigslist or Gamestop. This math adds up to 6 games for $30. Yeah, I would say this qualifies as a deal, especially since these are new games and I am going to sell the extras to make my money back. Nice! The only problem was, I had to travel to a couple different distance BB’s to actually pick up these games. Sure it was a major inconvenience that I had to travel many miles out of my way, in the freezing rain/snowy weather, with horrible last minute holiday shopper traffic, but it will be worth it in the long run. Further, these are first party Nintendo games. So you know what that means! Yup, more Club Nintendo coins. Hmmm, my hatred for BB just slightly gained a point in the positive direction.